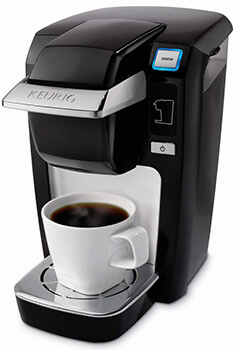 K10 and K15 belong to the same series of coffee makers by Keurig. Naturally, they share many similar features. Still, there are some aspects that they differ in. For instance, because K15 is a newer model, it performs with fewer bugs. It makes a good cup of coffee without any off-taste. Additionally, K15 comes in a wider variety of colors. It also has an auto-off feature, which stops the machine from making humming sounds in the idle mode (unlike K10). Keep reading, and you will find a more detailed description of all key differences between these two models. ●	The coffee might have an off-taste. ●	In some models, the water pump might be faulty. Because both K15 and K10 belong to the Keurig’s Mini classic series, they have a number of similar features. First of all, these two beverage makers are among the smallest models. They just make one cup at a time. The water reservoir doesn’t hold much (10 oz maximum), unlike in regular coffee systems. This is the best option for occasional coffee drinkers. People with a limited living space will also appreciate these compact models. Both of these machines belong to the same price category. However, the older model is a bit pricier. It costs around $20 more. Additionally, the hot K15 is currently on sale, so you can get your single cup brewer for the best price. There are 3 cup sizes available: 6, 8, and 10 oz. If you prefer your coffee stronger, it is better to pick the 6 oz sizing. The drip tray in both machines is removable, so you can fit larger mugs in there. However, keep in mind that the brewers are still rather short. Chances are your favorite huge mug will not work. Both beverage makers brew coffee, tea, and even hot chocolate. They are compatible with any K-cup. This gives you the freedom to choose among countless flavors and beverages. The K15 also features a reusable coffee filter. This means you can use your own ground coffee. This is ideal for people who want to know what exactly they are drinking. Each machine brews coffee in under 2 minutes. Of course, they make a noise, but it isn’t too loud or irritating. The older model also makes a subtle humming sound even when not working (idle mode). As for the K15, it has the auto-off feature. The machine turns off after it brews your cup of coffee to save energy. Obviously, it does not make the humming sound. K10 and K15 both require regular descaling. This will prolong their life. Additionally, this simple process will ensure the pure taste of your beverages. Descaling should be done regularly. Every 3-6 months will suffice, depending on how often you use your machine. The process itself is very simple and will not take more than 45 minutes. You will find all the descaling instructions in the manual or on the manufacturer’s website. The website has an informative tutorial video, which you can follow if needed. 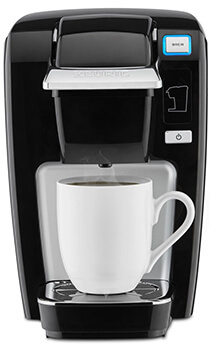 Must Read: What’s the Difference between Keurig K150 and K155? When you compare two coffee brewer models, knowing how they perform is probably the most important aspect. So, what you should know is that the main difference between the K10 1.0 K-cup Mini Plus and the K15 2.0 K-cup K-Mini is in the improved performance of the newer model. The K10 malfunctions occasionally. That’s why it was discontinued by the manufacturer. The older model had some issues with water overheating. It could spray the hot water and burn the users. This is a huge drawback. However, you should know that it isn’t present in all of the old models, just in some of them. Additionally, the 1.0 version sometimes makes coffee with a slight off-taste. Again, this does not happen every time. But the point still stands. Your beverage might have a slight plastic taste, which isn’t a good thing. Now, the manufacturer made sure to get rid of those bugs and released a newer model, K15. It does not overheat the water and makes pure-tasting coffee. However, its pump is what doesn’t perform flawlessly. Occasionally, it can pump less water than needed. These two brewers make beverage in the same amount of time (less than 2 minutes). They heat the water up rather fast too. The noise levels are bearable and not too loud, which is normal given the small size of these two machines. As you already know, these brewers are compatible with any K-cup. This means you can get pretty much any flavor you want. In general, both K10 and K15 make a good tasting cup of coffee. Again, K10 might add a slight off-taste, but this doesn’t happen often and depends on the particular machine that you get. If you prefer your coffee strong, the 8 and 10 oz cups might taste too thin for you. The solution is simple: pick the 6 oz option. Or, if you are using the K15 model, you can add your own ground coffee of any strength into the reusable filter. This way, you can control the coffee type and strength. To get the full picture, you definitely need to consider all of the pros and cons of each item. Both beverage makers have some drawbacks and many strong sides. And while you’ve seen some issues in the comparison chart, you need to also know the good stuff as well to make the most well-thought-out choice between K10/K15. Super compact, will not take too much space in your kitchen. Single cup maker, you don’t have to worry about the stale water in the reservoir. Works with pretty much any K-cup, even the refillable pods are suitable. Makes coffee, tea, hot chocolate, etc. Three optional beverage sizes: 6, 8, and 10 oz. Makes delicious beverages (if works properly). Some customer reviews note that the brewer occasionally overheats the water. It might spray out and burn the user. This is the reason why this 1.0 coffee maker model was discontinued and was replaced by the 2.0 version (K15). The same issue was present in the B31, another beverage maker from the K-mini series. Might start malfunctioning after some time. Overall, many reviews note that the brewing system tends to misbehave after 6 months or so. Takes quite some time to boil the water. This might be a disappointment for some users. Especially those who are oftentimes in a hurry. Rather expensive. Especially given its small size and limited functionality. Made of plastic. It might not be very durable. Small and easy to position in any kitchen. Looks sleek and features the simple, classic coffee maker design. Compatible with countless different K-cups and beverages, including coffee, tea, hot chocolate, iced drinks, etc. Simple button controls and intuitive operation make this personal beverage maker super easy to use. Personal, single cup model. This makes it ideal for occasional use. You will not have to worry about the stale water or changing water filters in the reservoir. Removable drip tray, makes more space for a bit larger mugs. Three personal size options for your beverages: 6, 8, 10 oz. The auto-off feature, turns the machine off after each use to save energy. Performs great overall, makes delicious beverages without any unwanted flavors. Not suitable for large, tall mugs. This might be a disappointment for some users. Some users recall experiencing issues with the water pump after a few months of usage. Plastic construction, might not be durable. Because K15 mini is a newer, improved model of its predecessor K10 Mini Plus, they share the same intuitive controls and operation. 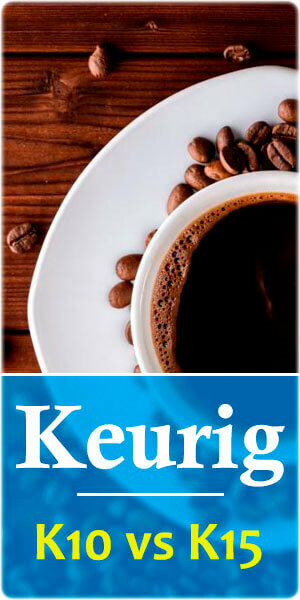 Overall, the Keurig company tries to make their products as easy to use as possible. All of their home coffee brewers do not involve a complicated setup process. This makes them ideal for personal use. Place your coffee maker near the power outlet and connect it to it. Press the power button. It will not illuminate the first time, so do not worry when you don’t see the light indication. Instead, the Add Water indicator will turn blue. Lift the lid of the water reservoir. Pour one cup of water (around 8 oz) in. Lower the lid and close the reservoir. Place your mug on the drip tray. Once the handle indicator flashes blue, lift the handle. The water will then travel from the reservoir into the brewer. Once the water is fully drained, lower the handle back. Remember not to insert a K-cup pod yet. You need to finish the first cleansing brew. Once you’ve lowered the handle back, press the Brew button. It will flash red during the brewing process. This is how it indicates that the water is being heated up. In around 2 minutes, the hot water will start pouring into your cup. Pour that water into the sink. You are now finished with the installation! You can start making your favorite beverage right away. Just don’t forget to add some water into the reservoir first since both K15 Mini and K10 Mini Plus are one-cup coffee makers. These steps are also clearly described and illustrated in the manual. So, when you get your new coffee maker by Keurig, you will know what to do exactly. When looking at the K15 vs K10 comparison side by side, you will notice that there aren’t many differences between these two coffee makers. In the chart, you’ve probably seen that they are of the same size and weight. Additionally, while being very compact, these Keurig coffee machines also look the same. water reservoir with the movable lid. As you can see, the exterior design of these coffee maker machines is rather simplistic. There are no displays or countless buttons and levers. You just get the essentials. There are simple one-touch button controls and a movable handle. Aesthetics-wise, both coffee maker models look very sleek and minimalistic. They are little, personal coffee brewer machines, which are designed to serve one cup of coffee at a time. Therefore, they will not take much space in your kitchen. Moreover, their clean lines and sleek exterior will fit nicely into almost any kitchen style. Now, while each single cup machine by Keurig has many similarities design-wise, there are some differences as well. To be more exact, they come in different colors. The K10 compact K-cup pod coffee maker is available in two colors: black and red. As for the K15 single serve device, it comes in seven different colors. You can get this brewing machine in black, blue, red, plum, jade, platinum, and green. As for the internal design, this is when it gets a bit tricky. The K10 Mini Plus is a discontinued model. It had some operation issues (which we will discuss later). Therefore, the company released a new version (K-15), with a bit different internal parts. It does not show the old bugs. However, the manufacturer does not really reveal what exactly has changed. So, we don’t know what new components the K15 features and what improvements have been made. As we have mentioned before in our review, the manufacturer made each single cup coffee maker very user-friendly. There are simple control buttons, and the whole process is very intuitive. Add the desired amount of water into the water reservoir. The minimal amount is 6 oz and the maximum is 10 oz. To make the process even simpler, you can just use the mug into which you are going to brew your coffee. Fill it up with water and pour it into the reservoir. Lift the handle after its indicator flashes blue. This will make the water drain into the brewer. Once all the water is drained, put the K-cup pod of your choice in the pod holder. Lower the handle to close the lid completely. Press the Brew button after it starts flashing blue. The button will then start flashing red, indicating that the water is heating. In about 2 minutes, the beverage will start to dispense. Once the brewer has made your beverage, lift the lid and dispose of the used K-cup pod. Voila! Your flavorful, delicious beverage is ready. As you can see, both coffee maker systems are extremely easy to use. All of the steps are described (and illustrated) in the manual. This means you will always have the step-by-step instructions. The manual also includes some troubleshooting notes and helpful tips. Therefore, even though you already know how to use your single cup coffee maker system, make sure to carefully read the manual anyway. There’s lots of helpful info in there. The Keurig’s customer support is not something to complain about. Their operators are always polite and willing to help. You can call the support line or send an e-mail if you are experiencing issues with your brewer. Whatever the case is, the response is going to be prompt. We have reached the customer support a few times to test how it works. Each time, the company representative was friendly and very helpful. They tried to guide us through the troubleshooting process. If your machine is defective, you will get the free replacement. Also, keep in mind that each model comes with a limited 1-year warranty. You can read about its conditions in detail on the manufacturer’s website. Or, again, you can call the support line if this way is more convenient for you. When it comes to comparing K10 and K15, the conclusion is pretty obvious. While they have many similar features, it is clear that K15 is an improved version of the older K10. The manufacturer made sure to deal with the old bugs. And this makes K15 a better option for the users. Of course, this model isn’t flawless either. But its minor drawbacks are not serious enough to outshine its functionality and performance. K15 makes great tasting coffee. It is intuitive and easy to use while being sold at a reasonable price. And we are sure it will be a great addition to your kitchen setup.